and every second you can shave off throughput cycles, every uptick you can achieve in accuracy levels, every square foot of space you can optimize, and every penny you can save on costs translates into significant increases in efficiency and customer satisfaction. The trick is to figure out where to find those tiny sources of error and waste and how to address them in ways that build customer confidence and contribute to bottom-line profitability. Are your processes regularly tested and updated? Are there mistakes or gaps in prescribed methods or process documentation? Are workers resorting to work-arounds in an attempt to avoid built-in errors? Does your culture discourage questions or dissent? Or does honest, open communication flow both up and down? Holding regular staff meetings (preferably with lunch and/or snacks provided) can encourage workers to share candid information about problems they encounter as well as ideas for improvement. Listen carefully, openly and positively. The folks on the front lines have the knowledge you need. Let them help you. Encourage friendly competition. Just about everyone has a competitive streak, so why not create a game or contest by posting employee throughput levels? Small, even silly prizes can contribute to the fun. Just be sure the competition stays friendly. No gloating or shaming allowed. Embrace baby steps. Most improvements will come incrementally, a result of tweaks in the process, better use of technologies, or upgrades in tools or training. Work with your staff to identify and try innovative adjustments. Weigh in. Implementing a weigh scale and digital verification system is one of the fastest, easiest ways to verify order picking accuracy in a large percentage of your orders. Hands off the documents. Manual document handling and insertion creates significant potential for errors and waste. Using a portable document inserter (or an automated printer and inserter system) instead is a high-speed, low-cost, low-risk solution. Follow the light(s). Pick-to and put-to indicators, used with goods-to-person technologies, provide easy-to-follow visual direction, which maximizes picking speed, improves order picking accuracy and even improves ergonomics. Make a statement. When you’re not use goods-to-person technologies for picking, hands-free voice picking is a good solution. Headset audio directs the picker to the correct location and directs the quantity to be picked. After making the pick, the picker audibly verifies the SKU and quantity. While voice picking typically increases throughput speed only slightly, it significantly increases accuracy. Play the slots. Grouping similar or related inventory items together – slotting – reduces search-and-travel time to increase speed and order picking accuracy. Count on the eye in the sky. Visual scanning technology has down in cost and up in quality. By inspecting SKUs contained in each picked order for accuracy, and diverting questionable order to quality checkers, visual scanning systems reduce labor costs and improve overall accuracy, especially when dealing with small items. Put WES in control. Supplementing your WMS or WCS with WES software can smooth the operational peaks and valleys among your different zones, which can reduce both equipment and labor requirements. SKU maps. Active light grids map SKUs into location-based cells, then preempts errors by using light and audio alarms to alert pickers when they are in the wrong SKU location. The goal of any picking process is to reduce the number of touches per item, with accurate one-touch picking as the ideal. UNEX offers unique solutions that can help you improve your numbers in your own distribution center. 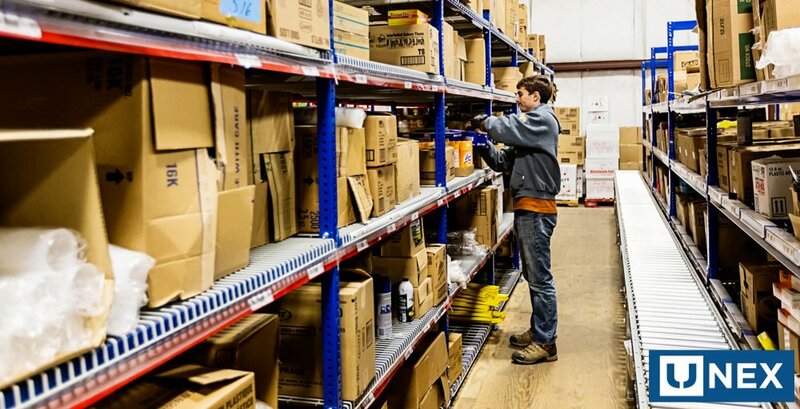 From lines picked per man-hour to order-picking accuracy to warehouse capacity to on-time order shipment, UNEX helps distribution centers improve efficiency for greater customer satisfaction and bottom-line profitability.